Sejung Marina Choi, Ph.D.* , Eunice Kim, M.A.,Soojin Kim, M.A.,Yi-Hsin Yeh, Ph.D.
University of Florida,Market Insights, Google, Inc. The present study identified five antecedents of advertising avoidance– three dimensions of perceived value of advertising (i.e., information, entertainment,and incentive), perceived advertising intrusiveness, and attitudetowards advertising – on Hulu.com, a popular consumer website thatprovides streaming video of television programs and movies. Based on surveydata, the findings showed that perceived intrusiveness of advertisinghad the greatest impact on ad avoidance, followed by attitude towardsadvertising. In addition, a post‐hoc analysis explored the mediational relationshipsamong the variables. Ever since the introduction of online video sites, the media industry has witnessed its rapid growth and widespread popularity. Online video sites provide a wide range of video content such as movies, television shows and other user‐generated video clips. Some video sharing websites may charge fees for consumers to view content, but the large majority of them offer free services to their audiences. Online video sites can be loosely cate-gorized into two types: Sites that serve as platforms for user‐generated vid-eos like YouTube, and sites such as Hulu that focus on providing the online format of professional video content mostly for free (i.e., television dramas, trailers, or movies) (Jones 2009). While advertisers hesitate to place ads on websites such as YouTube for the reason that they are unable to control the user‐generated content around which their ads are placed, they are relatively more optimistic about the potential of websites offering streaming videos of traditional media content such as television shows and movies as an effective advertising medium online. Especially with the explosive growth of online video sites like Hulu, the advertising budgets allocated for such websites also experi-enced a rapid increase accordingly. Indeed, advertising spending on Hulu in 2008 was approximately $70 million (Bradshaw and Garraha 2008) and four years later, Hulu's revenue grew to reach $695 million (Baker 2012). In addition, Hulu ranked no. 1 in video ads, generating more than 1.5 billion video ad impressions in the month of February, 2012. This number is even greater than the second and third biggest video ad networks combined during the same time frame (i.e., 1.1 billion video ads produced by Google including YouTube) (O'Malley 2012). Hulu also recorded the highest frequency of video ads during the month: On average, its viewers saw video ads 49 times (O'Malley 2012). Despite the industry’s optimism about the sites providing professional online content as an advertising medium, consumers’ acceptance of adver-tising placements on such sites remains unknown. Past studies suggest that people are increasingly resistant to television commercials and thus they ignore the ads (Clancey 1994) or use that time to participate in another activ-ity (Krugman and Johnson 1991; Speck and Elliott 1997). Online advertis-ing such as banner ads and pop‐up ads are also viewed as annoying and irritating (Edwards, Li and Lee 2002). Due to the irritating aspects of Internet ads, people tend to avoid online advertising (Benway 1999; Cho and Cheon 2004). However, the relatively newly‐developed format of online video adver-tising on video sites, holding both attributes that television and online ads have, possess some unique characteristics different from the more tradi-tional formats of online advertising. For example, various types of online video advertising such as ‘pre‐roll’ (i.e., video ads that roll immediately in advance of the video clip), ‘mid‐roll’ (i.e., video ads in the middle of the video content), and ‘post‐roll’ (i.e., video ads appended to the end of the program), were developed to improve advertising viewing experiences. In addition, online videos sites employ ad countdowns to let viewers know how long the ad will last. These advertising formats might lead viewers to perceive online video advertising to be less intrusive, and thus, influence viewers’ likelihood of avoiding such advertising. Further, people know that they can enjoy the ontent for free because the content is being supported by ads; hence, online video ads provide a certain value to them. On the other hand, just like other advertising formats, the ads embedded in the videos still unavoidably inter-rupt viewing of video content and might lead to a negative perception. Without a clearer idea about advertising effectiveness and acceptance, it is like a stab in the dark for advertisers to venture into the online video sites. Online video sites that provide professional video content can be seen as hybrid entities that incorporate characteristics of both traditional tele-vision as well as the Internet. Despite the growing numbers of advertising on online video sites, there has been little effort to examine advertising avoidance on such sites. Therefore, building upon previous literature on avoidance of television advertising and Internet advertising, the purpose of this study is to identify the contributing factors that influence the under-lying mechanism that leads a viewer to avoid advertising in the context of online video sites. Specifically, this study extends the literature by in-cluding antecedents of ad avoidance examined in past research as well as unique factors related to online video sites. Together, this study proposes that viewers’ perceived value of advertising, perceived ad intrusiveness, and attitude towards advertising would be related to their intention to avoid ads on online video sites. As one of the few exploratory studies that investigate this new form of media, results of this study could enhance our understanding of consum-ers’ video viewing patterns in relation to their attitude towards and avoid-ance of online video advertising. Theoretically, given the antecedents iden-tified in this study, a more comprehensive model explaining viewers’ ad-vertising avoidance patterns can be put forth and further our current under-standing of advertising viewing and avoidance in the online environment. Findings of this study also provide strategic implications for the practi-tioners regarding how to improve the effectiveness of video advertising on online video sites. Advertising avoidance, defined as "all actions by media users that differ-entially reduce their exposure to ad content," can be expressed by intentionally ignoring ads and shifting focus (Clancey 1994; Li, Edwards and Lee 2002), through other behaviors such as leaving a room (Abernethy 1991), or by me-chanical means such as using a remote control to fast‐forward the ads (Speck and Elliot 1997 p. 61). Television viewers can avoid advertising by switching channels and zapping television commercials (Heeter and Greenberg 1985). People’s tendency to remove television commercials from their attention is prominent during commercial breaks: they avoid advertising by muting and ignoring them, by leaving the room, or by doing other activities such as talking with others (Krugman and Johnson 1991; Speck and Elliott 1997). Moreover, ad‐avoidance technologies today such as digital video recorders (e.g., TiVo) allow television viewers to record programming while skipping over advertisements. Advertising on the Internet has evolved in different formats ranging from banner ads to pop‐up ads, paid text links, sponsorships, targeted sites, superstitials, and e‐mail ads (Zeff and Aronson 1999). However, people are more likely to avoid ads on the Internet than on traditional media. Compared with traditional media such as television, the Internet is recog-nized to be a more task‐ and information‐oriented medium rather than a medium for entertainment (Cho and Cheon 2004; Edwards et al. 2002). In other words, people’s behaviors on the Internet are goal‐directed, and therefore, they try harder to avoid advertising in an effort to protect them from interruption. ‘Banner Blindness’ refers to Internet users’ tendency to avoid anything that looks like banner display advertisements on the Web (Benway 1999) because they have little interest in the advertised product or the Web site the banners are placed on, and thus have no reason to click the ads (Pagendarm and Schaumburg 2001). Or this avoidance could be attributed to that fact that banners are simply not noticed due to their periphery loca-tions on Web pages, or they are not recognized as providing useful in-formation to Internet users (Benway 1998, 1999; Benway and Lane 1998). Pop‐up ads, the prevalent format of advertising on the Internet, appear when entering or exiting a Web page, interrupting viewers’ activity on the website. When forced to view the pop‐up ads, Internet users may respond by avoiding the ads on the Internet by cognitive, behavioral, or mechanical means, including reactions such as closing or deleting the pop‐up windows (Edwards et al. 2002). Online video sites provide viewers with a wide range of choices with millions of videos online. While user‐generated online video sites like YouTube account for the largest share of the online video market, online video sites that offer professional online video content, such as Hulu, are the ones that catch the greatest advertisers’ attention (Jones 2009). These online video sites which provide high‐quality streaming video services can be understood as extended media formats in which a television model is available on the Internet. This is supported by the fact that these websites, referred to as streaming television sites or streaming television technologies (Jones 2009), are the media channels within which a wide range of television genres are being positioned. The sites such as Hulu do not produce any professional online content on their own; instead, their businesses are centered on distributing the content produced and owned by media companies such as NBC Universal and News Corp through streaming via the website (Oruganti 2009). According t o Nielsen (2009), the recorded number of viewers for such video sites was over 123 million or about 43% as many people watching television over the same period in late 2008. The online video population reached over 182 million who viewed nearly 40 billion online videos in November, 2012 (comScore 2012). Online video sites may be understood as a convergent channel for traditional television and the Internet. People view video content originally produced for television on such sites. Just like traditional television which offers the audience information and enter-tainment, these websites may also present such values for their viewers. The value of advertising, defined as “a subjective evaluation of the rela-tive worth or utility of advertising to consumers”, is a useful tool for evaluat-ing the effectiveness of advertising (Ducoffe 1995, p. 1). Previous findings suggested that many people exhibit a high likelihood to avoid advertising in both traditional and online media (e.g., Cho and Cheon 2004; Speck and Elliot 1997). However, when advertising messages are relevant to consum-ers’ needs, consumers find the value of advertising. Ducoffe (1995) be-lieved that advertising works effectively when value is exchanged between consumers and advertisers through advertising messages. Ducoffe (1995) identified two key significant antecedents― in-formativeness and entertainment― that contribute to users’ perceived val-ue of advertising in traditional media, which he also employed in the study of advertising value on the Web (Ducoffe 1996). The value of information is obtained when viewers gain information for personal and social use from advertising, whereas the entertainment value is obtained through fun, rec-reation, and excitement experienced with advertising (Rubin, Perse and Powell 1985). In his research on people’s perceptions of advertising value on the Web (Ducoffe 1996), both value dimensions of advertising―in-formativeness and entertainment―found in the traditional media setting were shown to be applicable to explain consumers’ responses to ads in the online environment. He also found that Web advertising was generally viewed as informative and entertaining, although more informative than entertaining, which may not be in line with the generally held, negative perceptions of the Internet ads (e.g. Cho and Cheon 2004; Diaz, Hammond and McWilliam, 1997). It is reasonable to assume that one’s perceived values of advertising are reversely related to his/her avoidance of advertising. In other words, people are more likely to give attention to ads that are perceived to be valuable but avoid ads that are considered to have less value. Lee and Lumpkin (1992) found that zipping and zapping behavior, that is, the avoidance of television commercials, is moderated by the degree to which people view advertisements as containing useful information. This finding is also in line with research on ad irritation such that ads that are perceived to have informational value produce less irritation and avoidance than ads not per-ceived as containing useful information (e.g., Aaker and Bruzzone 1985; Pasadeos 1990). Similarly, to the degree that ads are perceived as enter-taining, they should provide value to viewers, and, therefore, they are likely to be negatively related to people’s intention to avoid advertising. H1: Perceived information value of ads will negatively influence ad avoidance on online video sites. H2: Perceived entertainment value of ads will negatively influence ad avoidance on online video sites. Although studies about advertising avoidance in the online environ-ment have been well established (Cho and Cheon 2004; Grant 2005), the mechanism underlying ad avoidance may vary across different types of web applications. Advertising on online video sites, as a new online adver-tising format, possesses some unique characteristics which may result in different value perceptions affecting ad avoidance when compared to other online advertising formats: They may offer viewers incentives. H3: Perceived incentive value of ads will negatively influence ad avoid-ance on online video sites. Ad intrusiveness is perceived when advertisements interfere with the goals of people and the idea of perceived intrusiveness was suggested to be one of the most influencing factors that lead to irritation and ad avoidance (Edwards et al. 2002). Based on the literature review, it seems that whether people perceive advertising as intrusive or not still plays a crucial role in affecting their ad avoidances in either traditional or online media. Intrusiveness, defined as the interruption of editorial content (Ha 1996), can be understood when advertisements interfere with the goals of consumers. In order to grab consumers’ attention, advertisements interrupt editorial content by limiting the number of goal‐related actions that con-sumers are willing to take. Some consumers may adjust their actions or goals to include advertising. However, some may generate negative re-actions towards the advertising, along with their avoidances of advertising (Edward et al. 2002). Similarly, Cho and Cheon’s study (2004) suggested that goal‐oriented Internet users are more likely to perceive advertisements as goal impediments and such perceptions of the ads lead to ad avoidance on the Internet. Intrusiveness of advertising may enhance recall by allowing the adver-tising to interfere with people’s goals and increase the possibility of the content being processed. However, it may result in negative attitude for-mation (Ha 1996). When advertising interrupts consumers’ goals, it may generate undesirable outcomes such as aggravation and negative attitudes (Krugman 1983). People feel irritated by ads when they are overwhelmed by its content or when their senses are excessively stimulated (Aaker and Bruzzone 1985; Bauer and Greyser 1968). As a result, people come to avoid advertising, as a retreat from the source of annoyance (Kennedy 1971; Krugman 1983; Park and McClung 1986; Soldow and Principe 1981). These lead to the following supposition: perceived ad intrusiveness is pos-itively associated with ad avoidance. H4: Perceived ad intrusiveness will positively influence avoidance of ads on online video sites. Attitude towards advertising has been one of the most important con-cepts in advertising and marketing research. Attitude, generally defined as “a learned predisposition to respond in a consistently favorable or un-favorable manner with respect to a given object” (Fishbein and Ajzen 1975, p. 6) is a basic underlying concept to understand an individual's attitude towards advertising − “a learned predisposition to respond in a consistently favorable or unfavorable manner toward advertising in general” (MacKenzie and Lutz 1989, p. 54). Attitude towards advertising is consid-ered as a major predictor of advertising effectiveness. H5: Attitude towards advertising will influence positively ad avoidance on online video sites. The theoretical analysis of advertising on online video sites in the con-text of media characteristics has allowed us to identify the factors influenc-ing site viewers’ ad avoidances. Based on our extant literature, we theorize that three dimensions of perceived value of advertising, perceived ad in-trusiveness, and attitude towards advertising function as antecedent con-structs that affect avoidance of advertising on online video sites. A con-ceptual model of this study, which includes the five research hypotheses with the predicted directions, is presented in [Figure 1]. Data for the present study was collected in December, 2009. A total of 80 college students from a major southeastern university participated in this study via a paper‐and‐pencil survey. College students were deemed as appropriate for this study because 76% of young Internet users aged from 18 to 29 reported watching or downloading an online video (Pew Internet and American Life Project 2007). The participation in this study was en-tirely voluntary. To rule out any confusion with regard to the unclear definition of ‘online video site,’ participants were asked to answer the survey based on their experiences on the Hulu website (http://www. Hulu.com). Hence, this study was limited to the students who had experience in using Hulu. The rationale for the choice of the Hulu website was that Hulu has become one of the most popular online video sites, offering video content through streaming. It has been often cited for its explosive growth in popularity (Kirkpatrick and Lashinsky 2008). Three out of 80 participants were drop-ped out of the present study due to their lack of experience in watching advertising on online video websites. A total of 77 participants’ responses were used in this study. Of the 77 respondents, 41.6% were men and 58.4% were female, with an average age of 23 years old. The majority of respondents was upper‐level college (53.5%) and graduate students (33.8%). Among them, 39.0% clas-sified themselves as Caucasian, 37.7% as Asian or Asian American, 18.2% as Hispanic, and 3.9% as African American. On average, our respondents have used the Hulu website for 10.03 months, and 40.1% of them were regular website visitors (3.9% on a daily basis, and 36.2% on a weekly ba-sis). Comedy was the most watched television genre (51.2%), followed by drama (36.2%) and animation/cartoons (23.8%). Four constructs were examined in this study: perceived value of adver-tising, perceived ad intrusiveness, attitude towards ads, and ad avoidance. Scales for these constructs were adapted from existing literature and modi-fied to fit the current study. All items were measured with seven‐point Likert scales, ranging from 1 being “strongly disagree” to 7 being “strongly agree”, except for attitudes toward ads, which was assessed by using a seven‐point semantic differential scale. Perceived value of advertising. This construct encompasses three di-mensions―perceived informativeness, entertainment, and incentive val-ues of ads. The perceived informativeness and entertainment value of ad-vertising was measured using Edward et al.’s scales (2002), which were originally developed by Ducoffe (1996). Both informativeness (helpful, important, informative, and useful) and entertainment values (attractive, enjoyable, entertaining, and fun to watch) were measured with four items (α = 0.90, M = 3.07, SD = 1.18 and α = 0.93, M = 3.33, SD = 1.41, re-spectively). Seven items measuring the incentive‐based value of advertis-ing were created for this study (α = 0.92, M = 5.33, SD = 1.13). Perceived ad intrusiveness. The intrusiveness scale was developed by Edwards et al. (2002), consisting of seven items — distracting, disturbing, forced, interfering, intrusive, invasive, and obtrusive (α = 0.94, M = 4.88, SD = 1.46). Attitude towards advertising. Attitude toward advertising on Hulu.com was measured with five items: (a) good/bad; (b) pleasant/unpleasant; (c) favorable/unfavorable, (d) believable/ unbelievable; and (e) qualified /unqualified (Choi and Rifon 2002; MacKenzie and Lutz 1989) (α = 0.90, M = 3.96, SD = 1.23). Ad avoidance. We adopted the ad avoidance scale from Cho and Cheon (2004). Five items from the original scale were selected and adjusted to fit the online video website setting. Two items were self‐created, which included: (a) minimized windows to avoid advertising on online video websites; (b) hid windows to avoid advertising on online video websites. The final seven‐item scale yielded relatively high reliability, α = 0.90, M = 4.37, SD = 1.28. A multiple regression analysis was performed to simultaneously test Hypotheses 1 through 5 regarding the influences of three dimensions of perceived value of advertising (i.e., informativeness, entertainment, and incentive values), perceived ad intrusiveness, and attitudes towards ads on ad avoidance. Tables 1 and 2 present the observed relationships between the five independent variables and the dependent variable, ad avoidance. Overall, the regression model was significant, F(5, 71) =19.09, p < .05, and the five independent variables explained 54.3% of the variance in the dependent variable. <Table 1> Regression model of perceived ad value, perceived ad intrusiveness, and attitude towards ad on ad avoidance: Analysis of variance regression results. <Table 2> Regression model of perceived value of ads, perceived ad intrusiveness, and attitude towards ads on ad avoidance: Multiple regression results. Contrary to the original hypotheses, three dimensions of perceived val-ue of advertising―informativeness, entertainment, and incentive, did not have significant impact on ad avoidance, disconfirming H1, H2 and H3. The results showed that perceived ad intrusiveness was the most influential predictor in the model with a β coefficient of .464, t (71) = 4.760, p < .05. The positive coefficient indicated that one standard deviation increase in perceived ad intrusiveness would lead to .464 standard deviation in-crease in ad avoidance, holding the other independent variables constant. In other words, the stronger a consumer perceives an ad to be intrusive, the more likely he or she would try to avoid the ad on Hulu.com. Thus, H4 was supported. Attitude towards advertising was the second significant predictor of ad avoidance, β = ‐.260, t (71) = ‐2.197, p < .05, which confirmed H5. The negative coefficient implied a negative relationship between atti-tude towards ads on Hulu.com and ad avoidance. That is, when a consumer holds a more favorable attitude towards ads on the website, he or she would be less likely to avoid the ads. 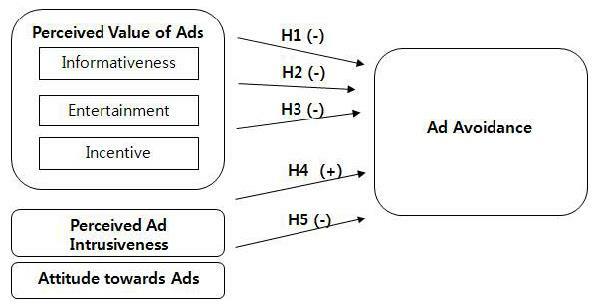 Although the first three hypotheses were not supported by the results of multiple regression analysis, it could be speculated that the influences of the three dimensions of perceived advertising value were overshadowed by another stronger and more direct predictor in the model such as attitude towards ads. In other words, attitude towards ads might mediate the effect of perceived value of ads on ad avoidance, and thus, perceived value of ads might only exert an indirect influence on ad avoidance through attitude towards ads. To test this alternative explanation, the following post‐hoc analysis was conducted to examine the mediation effect of attitude towards ads on other independent variables in the model. A possible explanation for the insignificant influence of perceived value of ads on ad avoidance might be due to the meditation effect of attitude to-wards ads. In other words, the three dimensions of perceived value of ads might have an indirect effect on ad avoidance through attitude towards ads. To assess this alternative explanation, additional mediation analyses, fol-lowing Baron and Kenny’s (1986) procedures, were performed to further examine the possible meditational relationships between ad avoidance, atti-tude towards ads, and other predictors (i.e., three dimensions of perceived value of ads and perceived ad intrusiveness) included in the original multiple regression model. To establish mediation, three conditions must hold: first, independent variables (i.e., the three dimensions of perceived value of ads and perceived ad intrusiveness) must affect the mediator, attitude towards ads, in the first equation; second, these independent variables must be shown to affect the dependent variable, ad avoidance in the second equation; and third, the mediator must be included in the third equation with other in-dependent variables, and it must show a significant effect on the dependent variable. In addition, the effect of other independent variables on dependent variables must decrease, compared to the second equation. The first regression equation indicated that both entertainment and in-centive dimensions of perceived value of ads positively influenced attitude towards the ads, β = .549, t (71) = 4.047, p < .05 and β = .316, t (72) = 3.334, p < .05, respectively. However, the informativeness dimension of per-ceived value of ads and perceived ad intrusiveness were not significant pre-dictors of attitude towards the ads. Together, this regression equation was significant, F(4, 72) = 23.953, p < .05, and explained 54.7% of the variance in attitude towards advertising. <Table 4> Regression model of perceived value of ads and perceived ad intrusiveness on attitude towards ads: Multiple regression results, F(4,72) = 23.953, p<.05, R² = .547. The second regression equation revealed a significant negative effect of the entertainment dimension of perceived value of ads on ad avoidance, β = ‐.374, t (72) = ‐2.677, p < .05, and perceived ad intrusiveness had a sig-nificant positive effect on ad avoidance, β = .469, t (72) = 4.695, p < .05. The informativeness and incentive dimensions of perceived value of ads did not have a significant influence on ad avoidance. Overall, the second equation model was significant, F(4, 72) = 21.516, p < .05, and accounted for 51.9% of variance in ad avoidance. <Table 5> Regression model of perceived value of ads and perceived ad intrusiveness on ad avoidance: Multiple regression results, F(4, 72) = 21.516, p<.05, R² = .519. Finally, the third equation (same as the original multiple regression for hypotheses testing, see Tables 1 and 2) showed that, when attitude towards ads was included as a predictor in the model, attitude towards ads sig-nificantly affected ad avoidance, β = ‐.260, t (72) = ‐2.197, p < .05, while the effect of the entertainment dimension of perceived value of ads de-creased, β = ‐.232, t (72) = ‐1.534, p > .05. However, another significant predictor in the second equation—perceived ad intrusiveness— did not decrease its significant influence when attitude towards ads was included in the third equation. Hence, the results provided partial support for the mediation explanation. The findings suggested attitude towards ads only mediated the effect of the entertainment dimension of perceived ad value on ad avoidance but not the effect of perceived ad intrusiveness. Taken together, attitude towards ads was a mediator for the effect of entertainment value of ads on ad avoidance, but incentive value of ads only had a significant impact on attitude towards the ads, but not on ad avoidance. In addition, perceived ad intrusiveness had a direct impact on ad avoidance, and the impact was not mediated through attitude towards ads. The results of the post‐hoc analysis suggest the observed relationships among variables in the current study could be further explored in future studies by using more advanced statistical methods such as structural equa-tion modeling or path analysis. Online video sites are one of the fastest growing segments of online media, and accordingly, they are considered by advertisers and marketers today as an attractive media channel for advertising placement. Unlike pre-vious online advertising formats, online video advertising has unique char-acteristics that could potentially attract viewers. However, little research has been done to examine the advertising acceptance of this newly‐devel-oped advertising format. Hence, the main objective was to identify factors that could account for viewers’ acceptance (or avoidance) of advertising on online video sites. Although this study is still in its exploratory stage, the findings of this study have made a theoretical and empirical con-tribution by identifying factors that impact people’s advertising avoidance behaviors when using online video sites. Derived from existing literature, several predictors of advertising avoidance were identified in our framework ― perceived value of ads (i.e., entertainment value, informativeness value, and incentive value), per-ceived ad intrusiveness, and attitude towards ads. Results of this study in-dicate that perceived ad intrusiveness and attitude towards ads were the two most influential predictors of ad avoidance. That is, if the individual perceived ads as intrusive and had a negative attitude towards them, he or she would be more likely to avoid the ads on online video sites. One of the intriguing results was that none of the three dimensions of perceived ad value ― neither perceived information, entertainment, nor incentive value ― had any direct significant impact on ad avoidance on most site users. To provide a possible explanation for the insignificant influence of per-ceived value of the ads on ad avoidance, a further post‐hoc analysis was conducted using meditation analyses. The result of the post‐hoc analysis showed that attitude towards ads mediated the relationship between per-ceived entertainment value and ad avoidance. 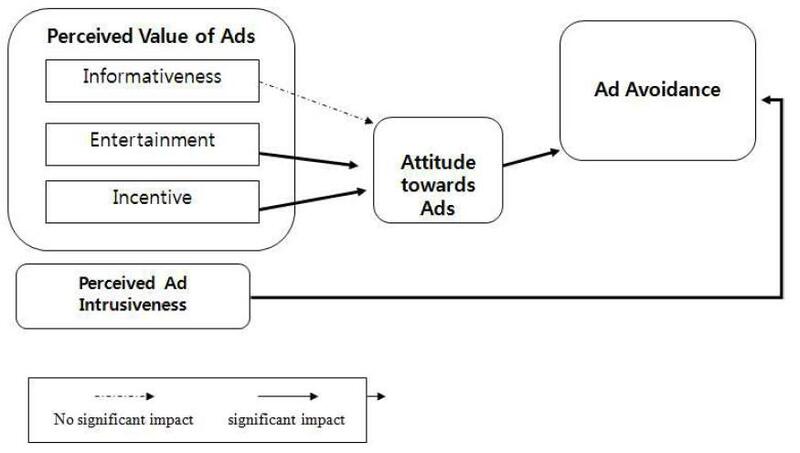 While perceived entertain-ment value of advertising had a great influence on ad avoidance with the effect of attitude towards ads as a mediator, incentive value of advertising just had an impact on attitude towards ads, not on ad avoidance. Based on the results from the empirical data, we have revised the hypothesis model as outlined in [Figure 2]. Given the results, perceived entertainment value of advertising was the most significant factor both affecting users’ ad avoidances and attitudes toward the advertising. An important practical implication that can be de-rived from this finding is that ad avoidance could be lowered when users perceive advertising as giving pleasure and excitement. This implies that the entertainment‐based value of ads is a major factor in determining the success of advertising on online video sites. This finding provides a prac-tical implication for advertisers. That is, in order for online video advertis-ing to have its impact, advertisers should take the characteristics of the TV genres into consideration. Placing ads in the TV genres that have greater entertainment values such as comedy or drama could effectively attract more viewers’ attention than placing ads on other types of genres that focus on information values such as news and politics. Moreover, it is worth not-ing that perceived ad intrusiveness played the most important role in affect-ing ad avoidance. Thus, it is strongly suggested to embed more contextually relevant advertising at less intrusive positions within online video content. On the other hand, perceived information values neither directly nor indirectly had an influence on viewers’ ad avoidance. This finding may have resulted from the potential influences that media context has on the advertising value. Advertising placed in a less credible medium such as television is considered to be less informative compared to media per-ceived as credible (Becker, Martino and Towners 1976). As online video sites such as Hulu are understood as a platform in which the traditional tele-vision model is applied to the video streaming service on the Internet (Jones 2009), the informational value of advertising on such websites may not be linked to avoidance of the ad. Finally, the results from the post‐hoc analysis reveal that incentive value of ads is the most influential dimension affecting attitude towards the ads on online video sites. A possible explanation of the study results is that peo-ple’s perceived value of advertising as offering incentives may not be strong in the context of online video sites. Incentive has been mainly exam-ined among Internet users who have to pay for using an online service. The applicability of the concept of incentive on ad‐supported free media content may be limited (LaRose, Eastin and Gregg 2001). People may fail to per-ceive incentive value of ads on online video sites, although they are satisfied with the high‐qualified video content the sites provide, because most online websites offer free services. Although incentive‐based advertising value was not found to influence ad avoidance, it is an important construct that is necessary to be further studied. The observed relationship between the incentive value of ads and attitude towards the ads has yielded great im-plications for future research. There are some limitations in this study that should be considered. First, the focus of this study was restricted to testing the proposed hypotheses regarding the influences of three dimensions of perceived value of advertis-ing, perceived ad intrusiveness, and attitude towards ads on ad avoidance. Although we have furthered our study by applying mediation analyses and identified attitude towards advertising as a mediating factor, a more in‐depth analysis is needed on the conceptual model. The model could be ex-tended to include how the independent variables influence each other. For example, it could be hypothesized that perceived value of advertising af-fected perceived ad intrusiveness, and furthermore, perceived ad intrusive-ness could be suggested as another mediator for the effect of perceived val-ue of advertising on ad avoidance and attitude towards ad. Therefore, the analysis of the interrelationship between the independent variables could be the next step to explore in our research area. Next, advanced statistical analysis such as structural equation analysis or path analysis could be em-ployed as an appropriate methodology to fully validate our hypothesized model. This paper examines the antecedents of people’s avoidance of advertis-ing on online video sites by asking about their experiences in using the Hulu website. One of the limitations that this study has is whether the findings from Hulu can be generalized to all online video sites. As noted, there are online video sites like Hulu in which people watch highly qualified video programs offered by professional video service providers. On the other hand, online video sites such as YouTube provide a website platform in which amateur Internet users upload video content, including self‐created content. For future research, it may be informative to distinguish the two types of online video sites and to apply the current research framework to advertising on different types of such sites. Future examination of factors that affect ad avoidance would be greatly enhanced by measuring people’s motivations for using online video sites. Given the basic theoretical background on viewers’ motivations for using online video websites, it is believed that people’s usage motives will help better explain the proposed conceptual framework. Users’ motivations af-fect their perceptions of advertising on online video sites, depending on the degree to which the advertising would support or interrupt in accom-plishing the motivations. Advertising on online video sites might be per-ceived as valuable by users if its existence is in accordance with their moti-vations of using the video site. More research is needed to define the usage motivations associated with online video sites to provide empirical data with relation to the media use motivations. The sample size was relatively small considering the growing number of online video site users. This study could have been more conclusive with a larger sample size. Also, it would be valuable to conduct an experimental study in the future that directly assesses people’s actual avoidance of adver-tising on online video sites in order to elaborate the definition of ad avoid-ance and the contributing factors. 1.Aaker, David S. and Donald E. Bruzzone (1985), "Causes of Irritation in Advertising," Journal of Marketing, 49 (2), 47‐57. 2.Abernethy, Avery M. (1991), "Physical and Mechanical Avoidance of Television Commercials: An Exploratory Study of Zipping, Zapping and Leaving," in Proceedings of the American Academy of Advertising, Rebecca Holman, ed., New York: The American Academy of Advertising, 223‐231. 3.Ajzen, Icek (1985), "From intentions to actions: A theory of planned behavior," In J. Kuhi & J. Beckmann (Eds. ), Action.control: From cognition to behavior, Heidelberg: Springer. 4._____ (1987), Attitudes, traits, and actions: Dispositional prediction of behavior in personality and social psychology. In L. Berkowitz (Ed. ), Advances in experimental social psychology, 20, New York: Academic Press. 6.Baron, Reuben M. and David A. Kenny (1986), "The moderator–mediator variable distinction in social psychological research: Conceptual, strategic, and statistical considerations," Journal of Personality & Social Psychology, 51, 1173‐1182. 7.Bauer, Raymond A. and Stephen A. Greyser (1968), Advertising in American: The ConsumerView? Boston, MA: Harvard University. 8.Becker, Lee B., Raymond A. Martino and Wayne M. Towers (1976), "Media Advertising Credibility," Journalism Quarterly, 53, 216‐22. 9.Benway, Jan P. (1998), "Banner blindness: The irony of attention grabbing on the World Wide Web," Proceedings of the Human Factors and Ergonomics Society 42nd Annual Meeting, 1, 463‐467. 10._______ (1999), "Banner Blindness: What Searching Users Notice and Do Not Notice on the World Wide Web," Ph.D. dissertation, Rice University. 13.Chen, Qimei and William D. Wells (1999), "Attitude Toward the Site," Journal of Advertising Research, 39 (September/ October), 27‐37. 15.Clancey, Maura (1994), "The Television Audience Examined," Journal of Advertising Research, 39 (5), 27‐37. 16.Cho, Chang‐Hoan and Hongsik J. Cheon, (2004), "Why do people avoid advertising on the internet," Journal of Advertising, 33 (4), 89–97. 18.Diaz, Andrea Narholz, Kathy Hammond and Gil McWilliam (1997), "A Study of Web Use and Attitudes Amongst Novices, Moderate Users and Heavy Users," EMAC. 1624‐1635. 19.Ducoffe, Robert H. (1995), "How Consumers Assess the Value of Advertising," Journal of Current Issues and Research in Advertising, 17 (1), 1‐18. 20._______, Robert H. (1996), "Advertising Value and Advertising on the Web," Journal of Advertising Research, 36 (5), 21‐35. 21.Heeter, Carrie and Bradley S. Greenberg (1985), "Profiling Zappers," Journal of Advertising Research, 25 (2), 15‐19. 22.Edwards, Steven.M., Hairong Li and Joo‐Hyun Lee (2002), "Forced exposure and psychological reactance: Antecedents and consequences of the perceived intrusiveness of pup‐up ads," Journal of Advertising, 31 (3), 83‐95. 23.Fishbein, Martin and Icek Ajzen (1975), "Belief, Attitude, Intention and Behavior: An Introduction to Theory and Research," Addison‐ Wesley, Reading, MA. 24.Grant, Ian C. (2005), "Young Peoples' Relationships with Online Marketing Practices: An Intrusion Too Far?" Journal of Marketing Management, 21 (5/6), 607‐623. 25.Ha, Louisa (1996), "Advertising Clutter in Consumer Magazines: Dimensions and Effects," Journal of Advertising Research, 36(July/August), 76‐83. 28.Kennedy, John R. (1971), "How Program Environment Affects TV Commercials," Journal of Advertising Research, 11 (1), 33‐38. .
29.Kelly, Louise, Gayle Kerr and Judy Drennan (2010), "Avoidance of Advertising in Social Networking Sites: the teenage perspective," Journal of Interactive Advertising, 10 (2), 16‐27. 30.Kirkpatrick, David and Adam Lashinsky (2008). "A New Way to Watch TV." Fortune, 157 (5), 33‐40. 31.Krugman, Herbert E. (1983), "Television Program Interest and Commercial Interruption: Are Commercials on Interesting Programs Less Effective?" Journal of Advertising Research, 23 (1), 21‐23. 32.Krugman, Dean M. and Keith F. Johnson (1991), "Differences in the Consumption of Traditional Broadcast and VCR Movie Rental," Journal of Broadcasting & Electronic Media, 35 (Spring), 213‐232. 34.Lee, Seonsu and James R. Lumpkin (1992), "Differences in Attitude Toward TV Advertising: VCR Usage as a Moderator," International Journal of Advertising, 11 (4), 333‐342. 35.MacKenzie, Scott B. and Richard J. Lutz (1989), "An Empirical Examination of the Structural Antecedents of Attitude toward the Ad in an Advertising Pretesting Context," Journal of Marketing, 53 (April), 48–65. 36.Nielsen (2009), "A2/M2 Three Screen Report, 4th Quarter 2008: Television, Internet and Mobile Usage in the U.S.," The Nielsen Company. Retrieved March 28, 2010, from http://www.nielsenonline.com/downloads/3_Screens_4Q08_final.pdf. 39.Park, C. Whan and Gordon W. McClung (1986), "The Effect of TV Program Involvement on Involvement with commercials," in Proceedings of Association of Consumer Research, Richard J. Lutz, ed., Las Vegas, NV: Association of Consumer Research, 544‐547. 43.Rubin, Alan M., Elizabeth M. Perse and Robert A. Powell (1985), "Loneliness, parasocial interaction, and local television news viewing," Human Communication Research, 12, 155‐180. 44.Speck, Paul S. and Michael T. Elliott (1997), "Predictors of Advertising Avoidance in Print and Broadcast Media," Journal of Advertising, 26 (Fall), 61–76. 45.Soldow, Gary F. and Victor Principe (1981), "Response to Commercials as a Function of Program Context," Journal of Advertising Research, 21 (2), 59‐65.